Parameters appearing on the screens were perfectly in line with what ITER was designed for. ''The more precise and thorough our simulation codes, the more efficient our plasma shots,'' explains Jean-François Artaud of CEA Research Institute on Magnetic Fusion (IRFM). 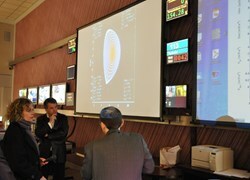 The place was the Tore Supra Control Room, the date: Thursday 10 March. 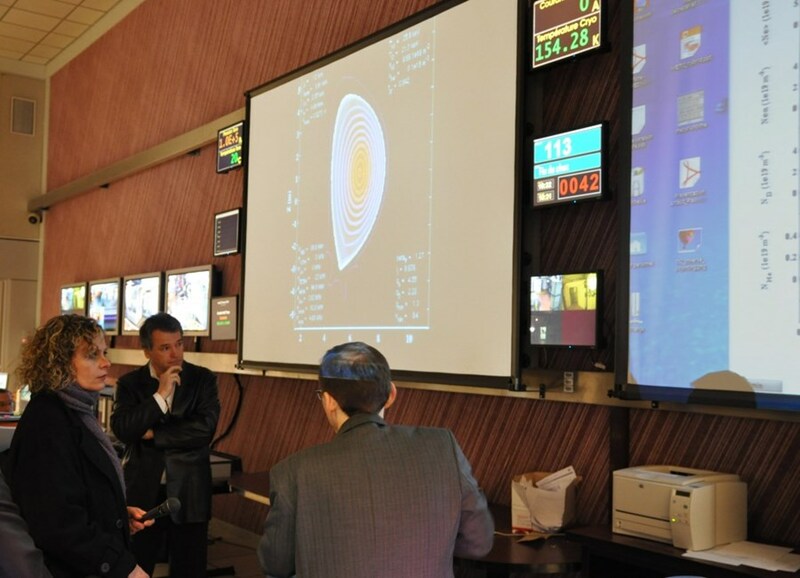 As we watched the large control screens covering the walls, however, place and date appeared different: we were in the ITER control room in the year 2030, four years after ITER produced its first deuterium/tritium plasma. Had it been a real shot instead of a virtual one, there would certainly have been cheers in the control room. Parameters appearing on the screens were perfectly in line with what ITER was designed for: ion temperature in the plasma core reached 250 million °C; plasma current was measured at 12 MA; and, as anticipated, fusion power production was in excess of 500 MW. What was feeding these figures to the screen was a simulation code named METIS. Such codes are essential to predicting the behaviour of future ITER plasmas. "When ITER enters operations," explains Jean-François Artaud of CEA Research Institute on Magnetic Fusion (IRFM) and METIS's main developer, "every shot will have to be very carefully prepared and simulated. 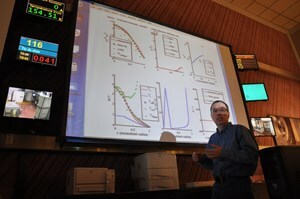 The more precise and thorough our simulation codes, the more efficient our plasma shots." As the characteristic ''D shape'' of the ITER plasma came alive on the screen, Jean-Marc Ane, of CEA IRFM, and Xavier Litaudon, Leader of the ITER Scenario Modelling group of the Integrated Tokamak Modelling Task Force, could almost believe the year was 2030. This brief excursion in time was organized as a side event to the "European Code Camp", a gathering of code developers from some 27 Euratom associations , held at IRFM from 7-18 March. In Europe, hundreds of code developers have been working for several years on a large variety of mathematical models to predict the behaviour of the future ITER plasmas. In order to coordinate this effort and eventually provide a validated simulation platform for ITER exploitation, EFDA established an Integrated Tokamak Modelling Task Force (ITM-TF) in 2004. "Developers all over Europe are in close and constant contact," explains Gloria Falchetto, a physicist at IRFM and ITM-TF leader. "It is important, however, that they meet face-to-face four to five times every year - especially if they can do it here, close to the ITER team." More than 60 different codes, based on different mathematical models and addressing different aspects of plasma simulation and tokamak technology, were developed over the years. Many of them however, use proprietary input/output interface, or are only suited for conditions in a specific tokamak. Exchanging tales of turbulence, disruption and instabilities, Gloria Falchetto, Integrated Tokamak Modelling Task Force leader, and Philippe Huynh, one of the developers of the Infrastructure and Software Integration Project. "The challenge is to bring all these bits and pieces together into a standard interface that enables the different codes to talk to each other," says Falchetto. "And this is precisely what ITM-TF is about." Codes are in constant evolution. "Code modelling integrates all our knowledge," explains Xavier Litaudon, Leader of the ITER Scenario Modelling group within ITM. "Data from any experimental breakthrough is immediately integrated into the codes, which are then checked against experiments in other machines. Elaborating codes implies permanent movement between theory and experiment." As "campers" sat around the virtual ITER plasma, they exchanged tales of turbulence, disruption and instabilities. "We interact much better this way," says Tom Casper, a specialist in Equilibrium and Control and one of the ITER participants to the Code Camp. "In ITER, things will be very unique. We'll need some very powerful and accurate tools to predict our plasma scenarios."